That didn’t come out clearly, did it? With my books, I like to push my characters mentally as well as physically. For Codename: Winterborn, my main character has his entire life falling apart around him, and it leads to some interesting results. For A Pius Man, I have a team that looks like the Fellowship of the Ring, and everyone has a personal stake in the outcome. In short, I write books where people get shot at a lot, and pushed to their physical and mental limits. And why? Because they're fun to write. The latest (by about a month) is A Pius Man: A Holy Thriller. It starts with a simple murder of an academic who had been researching the Vatican archives ... and then his assassin is blown up, and out a window, falling onto the car of the head of Papal security. From there, we’re off to the races. Soon, it becomes apparent that there’s Something Up, and it seems to be around the pope of World War II, Pope Pius XII – popularly known as “Hitler’s Pope.” It’s a decades-old mystery that has to be solved soon, or else everyone in Rome will pay the price. 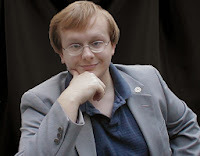 Let’s see – I’ve tried virtual book tours, Google ads (when they’re dumb enough to have a sale, or freebies), reviews copies sent out via Bostick communications, twitter, Facebook ... I think the next step is to start jumping up and down, waving my arms in the air. I’ve talked to book stores, and various and sundry groups just to read sections of my novel, but that hasn’t panned out thus far. Who are your favourite authors? That’s a bit of a list. I read constantly, and I read practically everything that isn't nailed down, and some of what is. But the books I have to read as soon as I they come out, are: Jeffery Deaver, James Rollins, Jim Butcher, Lee Child, Tom Clancy, Bernard Cornwell, Brian Haig (especially his Sean Drummond Series), and Kim Harrison thrown in. What advice do you have for other writers? Get a good editor... or a boatload of beta readers. What's your favourite quote about writing/for writers? “Fiction is different from reality; fiction has to make sense.” I’ve seen a citation on that one from Tom Clancy to Mark Twain. What's the best thing about being a writer? Making your own hours. Who is you favorite character in your book and why? Scott “Mossad” Murphy – he’s an American expatriate who decided that if he wanted to be on the front lines of the war on terrorism, Israel would be the place to go. Unlike everyone else, he’s not a fighter, he’s a thinker, and a perfect spy – no one ever sees him coming, and rarely even knows that he’s there. Why do you think readers are going to enjoy your book? Because I have a cast of colorful, vibrant characters investigating a real mystery (that of Pope Pius XII) to solve the fictional mystery in the novel. It’s more history than Dan Brown could wrap his brain around, with characters who are so real, some of them wrote the book. How long did it take you to write your book? That depends on how you want to count it. The first draft took me about 4 months … but the first draft was also 800 pages long, and sucked in every character I’ve ever created. There’s a reason that this is book one of a trilogy. Don’t worry, A Pius Man has no To Be Continued at the end. Who designed the cover? Sarah-Jane Lehoux. Believe it or not, she had premade the cover. I thought it was cool and James Bond-esque. And the price was right. Her covers and prices are the most reasonable I've ever seen. Yes, I'm deliberately advertizing for her, she's just that good. Did I learn anything? Well, I learned, once again, that my characters can take the novel away from me. When I started the book, I didn’t expect it to turn into a trilogy. I figured I’d have a good, solid novel, and move on. Then there was one character who wouldn’t die, and he kept extending the plot. And then there was a small war by book three. So that was fun. How do you research your books? Usually the books require very little research that I start for that book. My interests and hobbies are so eclectic and strange that I have yet to run out of material. For A Pius Man, it started out of a graduate paper I wrote on Pope Pius XII, so the historical research was always there. The weapons I used came out of a Time Magazine article I had read and remembered from 2000, as well as several conference panels I had attended with DARPA employees. Occasionally, I’ll need to do an internet search for half-remembered bits and pieces of data I collected along the way. What is your work in progress? Tell us about it. I’m working on two right now. 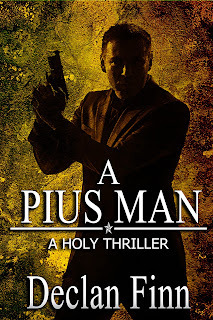 I’m editing A Pius Legacy, sequel to A Pius Man: A Holy Thriller, though real life has been getting in the way of that right now. The second book is a sequel to Codename: Winterborn, entitled Codename: Unsub. What are your thoughts on self-publishing verses traditional publishing? I don’t think traditional publishing is going away anytime soon, but it needs to get its act together. The employment in the publishing industry is starting to look like a revolving door. Back when I had an agent, he pitched my books to Doubleday every other month, and always to a different editor – usually, a replacement for the last one he pitched to. At the moment, publishing looks like a great big monolith that’s slow to adapt to change. For example, why are the publishing houses still in New York? There’s no reason for it. I live there, and we have some of the highest taxes in the United States, not to mention the most expensive real estate. With current technology – as used by Publish on Demand, e.g. – the publishing houses could move their offices practically anywhere, and still get their books out. Traditional publishing needs to shape up, unless they want to lose more and more writers to the self publishing world. They’ve already lost thriller writer Barry Eisler, and even Terry Goodkind has started to move in that direction as well. Maybe if they stopped putting out a James Patterson novel every five minutes…. Who or what inspired you to become a writer? Writer J. Michael Straczynski, and his tv show Babylon 5. I followed most of his writing advice online, and all of his articles about the craft. After a while, I tried my hand at it. It soon took over every waking moment, and some where I should have been asleep. Does your family support you in your writing career? How? Yes, they do. They’re my beta readers, my editors, and sometimes my creative consultants. Before you think “oh, that must mean unrestrained praise,” these are readers who devour books, and read newspapers with a blue pen in hand. If my books sucked, they’d tell me. And sometimes they have. I’ve spiked one or two novels along the way due to their feedback. Straczynski has been a major one for the fundamentals of writing. John Ringo has helped me put character, politics and action together in a nice neat package, and Timothy Zahn taught me how to have characters think their way around battles. What is this time you call “not writing?” When I'm reading books or watching television, I think “that's an idea. But I'd do it this way.” When I play video games (yes, I do play them), I will occasionally steal an element and warp beyond recognition it to fit another project I'm working on. I also take Krav Maga lessons … Krav Maga is the self defense system of the Israeli military. It’s very practical, based around real-world threats. It’s not a martial art, mostly because martial arts have rules... welcome to my fight scenes.